The classic monster magazine, celebrating the films of the silent era through the 1960s! Step into the "House of Dracula" as Kevin Surnear talks to Bela Lugosi Jr. who shares his memories of growing up with his famous dad,the man we knew as the real "Dracula" - Bela Lugosi. A look at the original THE FLY with Vincent Price. A retroactive blast from shockers of the past in the great Monster Show of 1939 - SON OF FRANKENSTEIN! Halloween make-ups by Bela Lugosi's buddy, Richard Shefield. Then it's off to Motown Monster Hosts with the history of Sir Graves Ghastly. A farewell to Monster Bash friend Ben Chapman who portrayed the land creature in CREATURE FROM THE BLACK LAGOON (1954) from fans around the world. We blast-off to the FORBIDDEN PLANET for an interview with actor Warren Stevens. 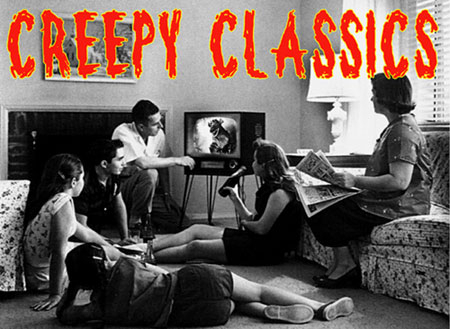 Loads of great photos, the Creepy Crossword, Trivia and much more Monster Fun! Writers include: Steven Thornton, Ben Martin, Larry Fultz Jr., Kevin Surnear, Barb Heiss. Artists include Sorko, Kerry Gammill, Lorraine Bush. Special contributions by Buddy Barnett.